Wupatki National Monuments is the perfect place to walk back in time and see what life was like 900 years ago. You can walk around and inside many of the pueblos that are still standing in the park. Make sure and stick to the trails because the grounds contain fragile archeological sites. Make sure and plan time to explore the ancient pueblos to see how ancient peoples lived in Arizona. Wupatki is the perfect place to view the highlands of Northern Arizona and learn more about Native American life in this area. The villages that you can see were built by ancient peoples known as the Hisatsinom, they are ancestors of today’s Hopi tribes. Along with other tribes including the Zuni and Havasupai tribes. They occupied the red rock stone and mortar dwellings from about A.D. 1100 to 1250. Around 1080 A.D. the eruption of nearby Sunset Crater forced some people to relocate for a while. The volcanic ash and cinder from the eruption created new fertile soil that worked great. 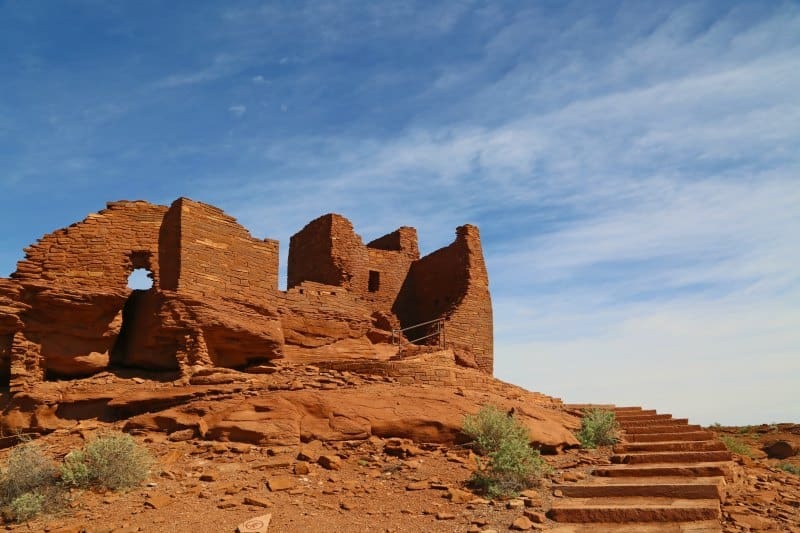 The Wupatki Pueblo was the richest and most likely most influential pueblo in the area. It is believed by archeologists that 85 to 100 people lived in the pueblo. Several thousand additional people would have lived within a days walk of the pueblo. 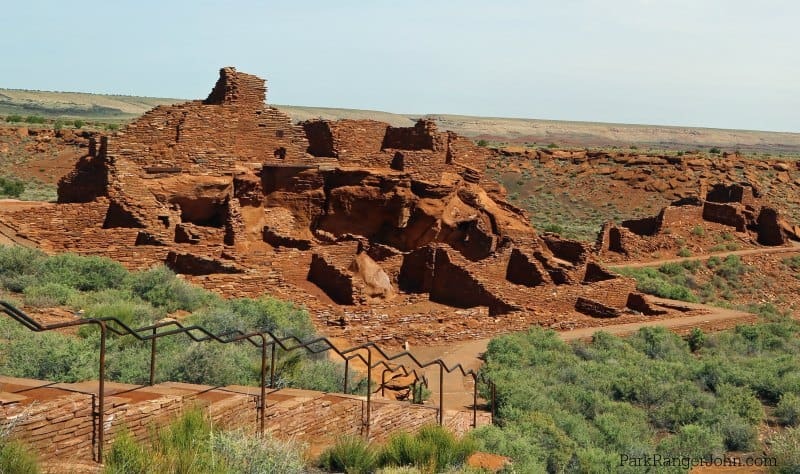 Archeologists have found turquoise, shell jewelry, copper items, and macaw feathers which prove that Wupatki was a trade center within a network that spanned hundreds of miles. The largest pueblo in Wupatki National Monument the Wupatki Pueblo is located right behind the visitor center. This pueblo was home to over 100 people and includes a ball court and unique blowhole. Make sure and bring some water with you for your walk. The walk around the Wupatki Pueblo is half mile easy trail. The trail was pretty even and easily maneuverable. You can choose to go down closer to the pueblo or view it from the top of the trail. There are multiple other pueblos in Wupatki National Monument that can be explored with short hikes. Keep an eye out for signs leading to Lomaki and Box Canyon Pueblos, Citadel and Nalakihu Pueblos, and Wukoki Pueblo. The trails can be uneven and filled with rocks so be prepared when you head out on them. There are pit toilets available at a few of the trail parking lots. All open pueblos are accessible from the scenic loop road. A short spur road leads to Wukoki Pueblo. If you are visiting with kids make sure and stop at the visitor center to pick up the Wupatki National Monument Junior Ranger program. If you want to learn about the park ahead of time you can download a copy of the Junior Ranger program here. Wupatki National Monument offers a variety of guided hikes from October through April. Guided hikes provide the only public access to many areas of the monument. Guided Discovery Hikes take place on Saturdays throughout the winter. Discover the archeological sites, petroglyphs, geology, flora, and fauna that make Wupatki National Monument a beautiful place. Hikes are 2- 3 miles on moderate terrain. For a more in-depth and longer hike check out the Crack-in-the-Rock hike, offered on weekends in April and October. This hike is run on a lottery system due to the limited number of guests that can participate. This is a strenuous, 25-mile (40 km) cross-country overnight trip, carrying a 30-40 pound pack. Each hike is limited to 12 people; the minimum age is 10 years. The cost is $75.00 per person. For more information call 928-679-2365. Keep an eye out on this page for updated info on the next lottery to get your name in for the Crack-In-the-Rock Hike! Don’t worry if you don’t feel like heading out on a 2-25 mile hike through Wupatki National Monument you can still take a ranger-led interpretive program and learn more about the park! Wupatki Pueblo Walks – Pueblo walks offer the chance to tour the 104 room Wupatki Pueblo with a Park Ranger. These walking tours introduce you to the Pueblo’s incredible past, from the Ancestral Pueblo people who built it, to the early Park Rangers who lived in it. Ranger’s Choice Patio Talk – These short interpretive programs take place under the shade awning at the Wupatki Visitor Center and last around 20 minutes. The topics vary depending on what the Park Ranger want to chat about. Interpretive Programs are offered at the Wupatki Visitor Center during the summer and peak holiday seasons. Call (928) 679-2365 to check schedules. Closest Airports – Phoenix, Las Vegas, Flagstaff, and Tusayan. Driving Distance – Flagstaff to the Wupatki Visitor Center is 45–60 minutes. 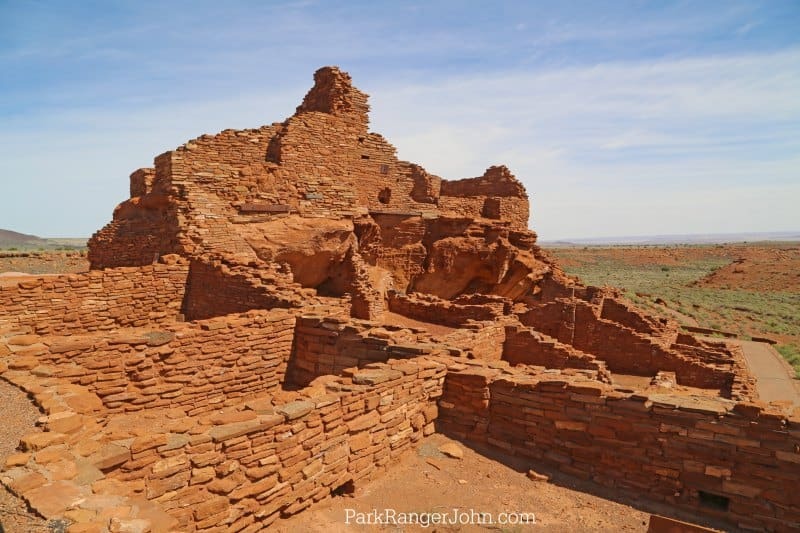 How to drive to Wupatki National Monument – Wupatki and Sunset Crater Volcano National Monuments are connected by loop road FR-545. You can enter the loop road near mile markers 430 (Sunset Crater Volcano) and 444 (Wupatki) on U.S. Highway 89. From Flagstaff – take US-89 north for 12 miles (19 km). Turn right at the sign for Sunset Crater Volcano and Wupatki National Monuments. The Wupatki Visitor Center is 21 miles (34 km) from this junction. Sunset Crater Volcano and Wupatki are located along a 35 mile (56 km) scenic loop road that travels through Ponderosa pine forests, open meadows, pinyon-juniper forests, and grassland. Enjoy views of the San Francisco Volcanic Field, Painted Desert, and the mesas of the Wupatki Basin. From U.S. Highway 89 use the north or south entrance. How much does it cost to visit Wupatki National Monument? Can I bring my Dog to Wupatki National Monument? – Pets are not allowed at the monument. Is Wupatki National Monument wheelchair accessible? The visitor center and portions of the Wupatki, Wukoki, and Nalakihu Trails are accessible. Accessible restrooms are available at the visitor center and Lomaki Pueblo. 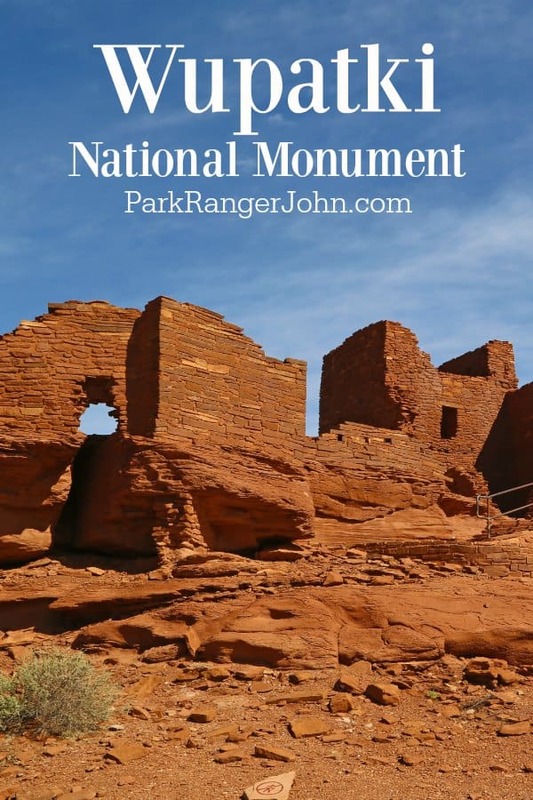 Things to know when visiting Wupatki National Monument! The closest restaurants to the park are an hour away in Flagstaff, Arizona. The visitor center does sell some small snacks. The following are how to say the names of Puebloan structures at Wupatki National Monument. These are not the names the ancestral people gave the pueblos, but names provided by their later Hopi descendants. Check out all of the Arizona National Parks and neighboring National Parks in New Mexico! Do you know how many parks you have visited? You can head over to this List of US National Parks in Alphabetical Order to count how many of the 61 National Parks you have visited.